Due to technical difficulties, the first 15 minutes of today’s program are not available in the stream and podcast. Much of the content is available in the show notes below. We apologize for the error. Today’s hosts: Scot Landry and Fr. Mark O’Connell, Judicial Vicar for the Metropolitan Tribunal of the Archdiocese of Boston. Today’s guest(s): Bishop John D’Arcy, bishop emeritus of the Diocese of Fort Wayne/South Bend, Indiana and a former auxiliary bishop of Boston;,and Fr. Michael Harrington, director of the Office for Cultural Diversity and Outreach and assistant director of the Office for Vocations of the Archdiocese of Boston. Today’s topic(s): The importance of Lenten retreats and missions; Cardinal Seán’s Lenten message to Catholics in the Archdiocese of Boston; Listener questions about Lent and Lenten practices. A summary of today’s show: Today’s hosts and guest discuss Cardinal Seán’s Lenten homily on Ash Wednesday and its call for Catholic to use this time to take stock, to “update our obituary,” and to make sure that we’re always moving forward in the spiritual life. Lent is also a perfect time for the work of evangelization that is Catholics Come Home. This initiative is one of the spiritual works of mercy to which we are commended during Lent. Bishop John D’Arcy also recalled his years as a priest and then bishop in Boston and then talked about how Lenten missions and retreats are a spiritual aid to Lent, as well as a work of evangelization and a renewal of the parish. Finally, Scot, Fr. Mark, and Fr. Michael answered some common questions about Lent, especially those surrounding the practice of fasting. 1st segment: Scot and Fr. Mark recalled their experience of Lent as children, giving up meat on Fridays. Fr. Mark then gave a brief summary of his life and vocation as a priest. As judicial vicar, he is “the canon law guy.” The Metropolitan Tribunal’s main focus are marriage cases and annulments. They also do some criminal cases, financial cases, and even cases related to saints. In future broadcasts, they will delve into those subjects more. One day he came back from lunch and said he’d had a great lunch of chicken noodle soup. His secretary reminded him that it was a Friday in Lent. Another worker in the office, who happened to be Jewish, came in then and called out, “Look, I’ve got my tune sandwich. It’s Friday in Lent.” So, the Jewish woman remembered Lent, but the priest did not. 2nd segment: Scot asked Fr. Michael Harrington what his hopes are for Catholic radio. He said St. Paul would be doing the same thing if he were here today, using every means to reach out to people. What suggestions would Fr. Michael have for people to enter into Lent. He said, the most important thing is to just do something. To start something. Fr. Mark said, that if busyness in prayer gets in the way, we need to focus. We need to quiet the brain and quiet all the stuff going on around us, so we can hear God speak to us. We have a very busy life, Scot said. But we need to make an appointment with God, even if it just for 10 or 15 minutes. He asked the Fathers what they think are the best times to pray. Fr. Michael said early mornings are best because it’s before everything gets hectic and it also sets the tone for the day, placing his time before God. Fr. Mark said he recognizes how the morning is best for others, but for him the end of the day is best because his examination of conscience is where he meets God the most. In his homily, the Cardinal said Jesus is just as concerned with the “how” as much as the “what” of our faith practice. Fr. Michael tied it in with the Cardinal’s words that we should not settle for mediocrity in our life. We should strive to be great. The Cardinal also said, Standing still is going backwards in life. Either we go forward or we fall back. Scot said that just showing up is not enough. Lent can help us establish new habits to grow in faith and to break old habits that are not helping us move forward in prayer. Fr. Michael: “Lent is a matter of the heart.” The voice of Christ speaks in our heart. When we seek Him, we find He’s been seeking us. 3rd segment: This Lent, Cardinal Sean has launched the largest outreach initiative in more than a generation for us in the Archdiocese of Boston. It is called Catholics Come Home. Let’s listen now to the conclusion of his Lenten message where he asks us all to incorporate Catholics Come Home into our practices this Lent. Fr. Mark said evangelization is Cardinal Sean’s passion and we’ve had so many distractions since he’s come here and this is finally a time for him to focus us on this, his passion. Scot said, Boston is often an example around the country for our works of charity, but we haven’t yet distinguished ourselves for our evangelization. Fr. Michael said the Cardinal tied together the spiritual and corporal works of mercy. As Catholics, they are not optional. Fr. Michael recalled a new pastor telling him that his goals for his new parish were to find out of the parish was living the works of mercy. The corporal works of mercy are to feed the hungry, to give drink to the thirsty, to clothe the naked, visit the sick, visit the imprisoned, and bury the dead. The spiritual works of mercy are to correct sinners, instruct the ignorant, counsel the doubtful, comfort the sorrowful, bear wrongs patiently, forgive injuries, and pray for the living and the dead. Basically to care for people’s physical needs and the needs of their soul. The Church exists to bring Christ to the world around us, not just in our actions, but to be deliberate in speaking the Gospel. Fr. Mark said that what strikes him about Catholics Come Home is that we are reaching out to our own people; it’s a new focus for evangelization. The Cardinal has asked us to pray for those who will receive an invitation and those of us who will invite, then to do the inviting, and then to be welcoming in our parishes. If we see someone new at Mass this Sunday, reach out to them, introduce yourself, and welcome them. 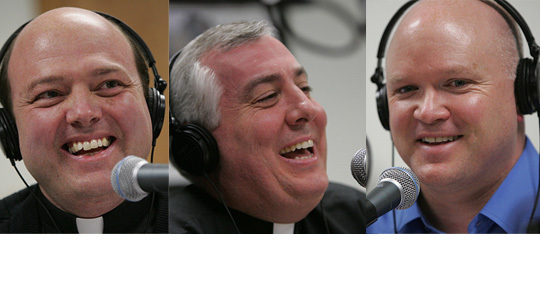 4th segment: Scot welcomes Bishop John D’Arcy to The Good Catholic Life. Bishop D’Arcy has been a priest for 54 years and next Monday he will return to his first assignment as a priest at St. Mary Star of the Sea in Beverly for a parish mission. He spent 8-1/2 years and it’s where the people taught him what it means to be a priest. It was an extraordinary experience. When he moved onto his next assignment in Rome, he left with a deep appreciation of what it means to be a parish priest. A parish mission and Lenten retreat is a good practice for Lent. Why should Catholics seek to attend the mission at their own parish or, if your parish isn’t having one, at a nearby parish like St. Mary’s in Beverly? Bishop D’Arcy said that the missions are about faith, prayer, sacrament of penance, but the real strength of them is strengthening the faith of the devout, and also reaching out to those whose faith has become weak. The key is the work of the laity in the parish to prepare for the mission, to reach out to everyone in the parish, to provide services like babysitting or transportation for the elderly. Parish missions should also tie themselves into Catholics Come Home. These large group gatherings in parishes help people to approach church in anonymity because it might make them feel more comfortable than making an appointment with a priest or even coming to Sunday Mass, at first. Likewise, if they don’t go to confession that week, then maybe they will be inspired to go sometime later and return to the practice. What is the central message of this mission, which is entitled “Christ, Yesterday, Today and Forever”? During the mission, the bishop will speak of the challenges of modern life to a life of prayer; the call to repentance and penance; Eucharistic spirituality, bringing Christ to others; and what the parish will do after the mission, where the parish needs to do more work. In February, Bishop D’Arcy was diagnosed with prostate cancer, and he said he is doing fine. He made sure with the doctors that he would not have any radiation treatments before the mission so that he would be strong for the people of Beverly. His outlook is good and he’s more than halfway through treatment. He has received many, many letters promising prayer, both from people in Boston and those in Fort Wayne. A week on the North Shore near the ocean will be just the thing for him. His retirement has kept him busy, giving quite a few retreats for priests, bishops, and religious in various places. After the St. Mary mission on Tuesday night, he will give three talks at Blessed John Seminary on Wednesday and then return to Beverly. Then on St. Patrick’s Day, he must celebrate a Mass while in Boston. The rest of the week’s schedule is also full. He does miss shepherding the diocese, because you hold the diocese in your heart, but now there’s more time for prayer and reading. He is adjusting very well. What do we have against meat and can we substitute lobster for meat? Back in the day when the practice started, meat was for the privileged and fish was for the poor, so it was an attempt to connect everyone to the poor. Technically, lobster would be in the letter of the law, but it’s not in the spirit of sacrificing for the poor. Why aren’t Sundays part of Lent and does this mean we can “cheat” on Sundays? Fr. Mark says this is a disputed question. He’s of the opinion that Lent includes Sunday as far as sacrifice goes, but Sundays are mini-Easters and a time of feasting; we do not fast. Scot says he’s always been taught we don’t need to fast on Sundays. Fr. Michael agreed with Fr. Mark. Why does the Church use Lent and Easter as the time to prepare those entering the Church through RCIA? Lent is a baptismal retreat, according to Pope Benedict and Cardinal Sean. While we may be used to focusing on Good Friday throughout Lent, but the Church’s liturgies have always been about Lent being a time of rebirth and purification. Fr. Michael said Lent is a time of detaching ourselves from the world and clinging to the things of God. Do any drinks violate the fast? Certainly a bunch of chocolate milkshakes or half of refrigerator of fruit in a smoothie would violate the spirit of the law. Fr. Michael said we need to look at what we’re trying to accomplish. Scot noted that the purpose of the fast is to notice the effects of the fast, so if we’re drinking so much that we don’t feel the effects that might not be in the spirit of the fast. Are the stations of the cross experiencing a renewal in popularity? Fr. Michael sees more parishes bringing back regular stations of the cross throughout Lent as well as regular Eucharistic adoration, prayer the Rosary before Mass, and other devotions that bring vibrancy to the Church. Scot noted that many devotions went away as the Church adjusted post-Vatican II and now we’re bringing those back, especially among the young. Fr. Michael noted all the young people who will come to the Eucharistic Congress.